Please note that the content of this book primarily consists of articles available from Wikipedia or other free sources online. 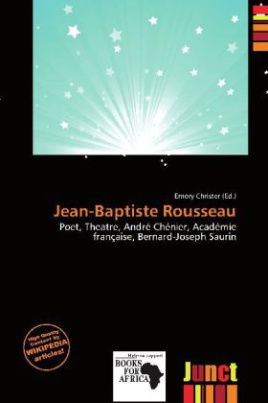 Jean-Baptiste Rousseau (6 April 1671 17 March 1741) was a French poet.Rousseau was born in Paris, the son of a shoemaker, and was well educated. As a young man, he gained favour with Boileau, who encouraged him to write. Rousseau began with the theatre, for which he had no aptitude. A one-act comedy, Le Café, failed in 1694, and he was not much happier with a more ambitious play, Le Flatteur (1696), or with the opera Venus et Adonis (1697). In 1700 he tried another comedy, Le Capricieux, which had the same fate. He then went with Tallard as an attaché to London, and, in days when literature still led to high position, seemed likely to achieve success.